In an earlier post, I explained how I use plain text files and Notational Velocity as a task-management alternative to the GTD program Things. Towards the end of that post, I also hinted that I have been able to automate parts of my system by using some Applescript and Automator tricks. Most of these tricks depend on using an apparently little-known feature of Notational Velocity, which is the ability to perform the "search" command on your notes using Applescript. As Notational Velocity users know, what makes the program unique is the fact that most of its functions begin in the "search" bar. If you want to create a note, you go to the search bar, begin typing the title of your new note, and click enter to create it. If you want to open an existing note, you also go to the search bar and begin entering the text that you want to find. search "Name of the new note"
The first part of this Applescript tells Notational Velocity to search for whatever text is between the quotation marks after search (in this case, Name of the new note). The second part of the script uses System Events to simulate the process of hitting return, which you would ordinarily do in Notational Velocity to create your new note after entering its title in the search bar. It also adds key code 53 (which has the same effect as entering the Escape key) so that the query is cleared from the search bar after the new note is created. Finally, since the first part of the script activated Notational Velocity, thereby bringing it to the foreground, the script concludes by hiding the NV window from view so you can go back to whatever you were doing. With some slight modifications, you can also use a script like this to enter some text into the body of the new note you create, but more on that in a moment. First, if you are familiar with NV and are following along so far, you’ll probably realize that this script has some important limitations. Namely, if the text string that you’re searching for is already in a note in your NV database, you’ll run into some problems because instead of creating a new note, NV will find the note with that text. Nonetheless, this script has been useful in helping me to automate parts of my previously-described GTD system. Here’s an example: in a previous post, I explained how and why I use my iPad to grade student papers. I also use my iPad to annotate other documents that need feedback from me. So when I receive a paper to grade or a document to annotate, there are two things I need to do: (a) get the file to my iPad for annotation; (b) add a "to do" (or a qq, using the syntax I explained before) to Notational Velocity so I’ll remember that I need to read the file. To accomplish both of these tasks at once, I use an Automator workflow that incorporates a beefed-up version of the simple script above. Before showing you the workflow, however, I should also explain why I now prefer to use GoodReader, rather than iAnnotate, for most of the annotation that I do on my iPad. When I wrote my earlier post on grading with my iPad, I was using iAnnotate, and sometimes I still do. But I’ve switched to GoodReader for annotating most PDFs, in large part because the process of syncing files to my iPad is easier and more intuitive. Since I wrote my earlier post, GoodReader has also added a full slate of annotation tools that compares nicely with iAnnotate and even adds some features that work better, in my view. I learned about GoodReader’s killer syncing capabilities from this episode of Mac Power Users, which also discusses lots of other features peculiar to GoodReader. The most important payoff is this: GoodReader allows me to keep particular folders in my Dropbox automatically synchronized between my iPad and my desktop. For example, I have a folder in my Dropbox called "annotate." I have set up GoodReader so that this folder is synchronized on my iPad. So whenever I add a file on my laptop to the "annotate" folder, I can get this file on my iPad just by tapping the "Sync" button in GoodReader. Then, when I annotate the file on my iPad, I just tap "Sync" again, and the marked-up file will appear in my Dropbox and on my laptop. Nifty, no? 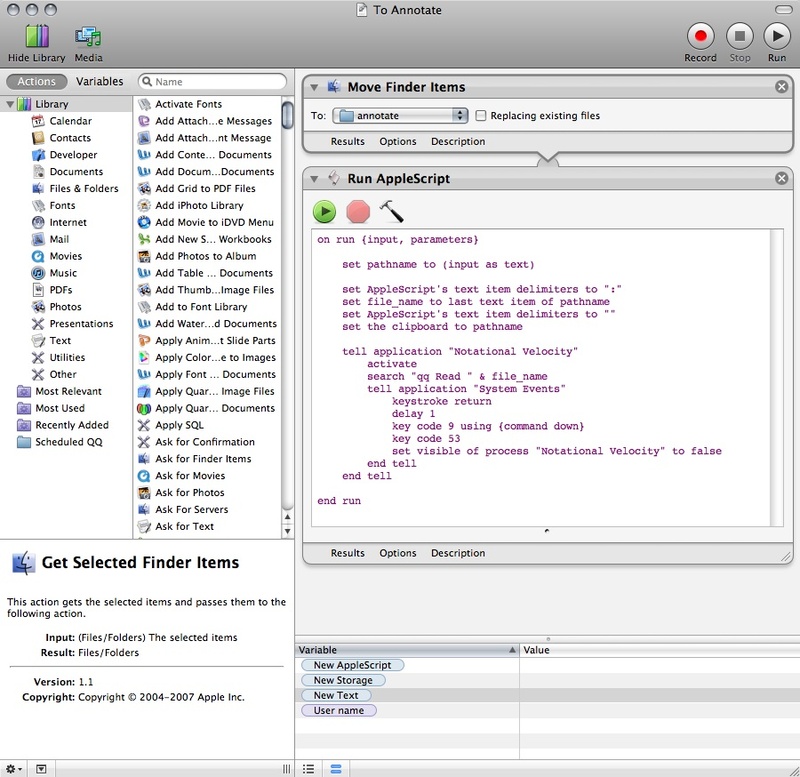 To see what my Automator workflow looks like, click on the image below to enlarge. Sometimes the file I need to annotate comes to me as a Microsoft Word document, in which case I also need to turn the file into a PDF. 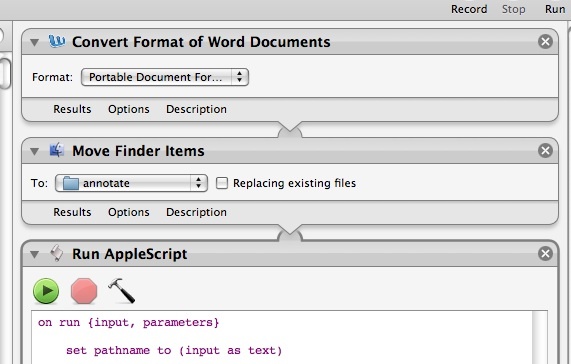 So I have a separate Automator workflow with an extra step at the beginning that turns Word documents into PDF files. Click the image below to see what I mean. To make a (potentially even longer) story short, I have saved these Automator workflows as plug-ins for Finder. (I am still using Mac OS 10.5.8, and Automator underwent some significant changes in Snow Leopard, including the elimination of "plug-ins" in favor of something similar called Services) So when I have a file in my Finder that I want to annotate in GoodReader, I basically right-click on the file, navigate to my "To Annotate" workflow, click on it, and voila: the file is moved to my annotate folder, and a new task is created reminding me to read the file. I’ll see that task next time I do my GTD review. That’s just one example of the kinds of automation I can add into my plain-text GTD system, and it’s certainly the one I use the most. But since you can schedule Applescripts to run on particular dates in iCal, it’s also easy to imagine how you could use a simple Notational Velocity Applescript and iCal to simulate the process of automatically creating scheduled or repeating tasks in Things. But that is a post for another day. UPDATE: I’ve since figured out how to do this particular workflow much more efficiently using a shell script and the command line. 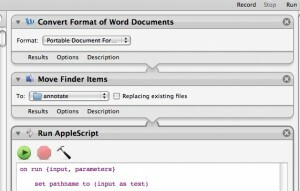 Still, the Applescript functionality of NV might be useful for other workflows. This entry was posted in Profhacks by Caleb McDaniel. Bookmark the permalink. 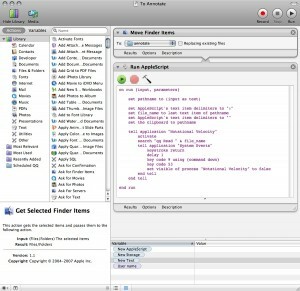 I found it interesting how you can use Applescript to automate specific tasks. This could be extremely useful for backing up specific files every night to a specific folder or on a network. Whenever I have to create a new word document for my dog tricks students, I always have to spend a minimum 10 minutes each time to format the document, insert the logo of my company, etc.